The script described next will output the histogram directly on the page, creating an HTML table which can be then viewed. Of course, this is one of the simplest solutions; you can of course display it as an image, store or perform any additional tasks on it. Posted by: Indy on October 30, 2006 at 14:37. Posted by Brook on November 1, 2006 at 08:58 PM. A grayscale version of a given color image can be defined in many ways and therefor there are more "equivalents". The one described in the link above takes into account the response (sensibility) courve of the human eye and thus through statistical research, some weights were determined. The method used in this article is a more simple one, which only takes into account the actual RGB value. Both methods can be considered correct since the idea of "good" or "bad" image is purely subjective and depends on each individual. Posted by Indy on November 2, 2006 at 06:37 AM. First I would like to thank you for posting this code.I have tried with single image itz working fine.I need to generate histogram of more than 1000 jpeg images.I have kept the images in a folder and generating the histogram for the images.The program is able to generate histogram for 170 images after that it shows exceeded 60 secs execution time at the line where the RGB values are obtained [$rgb = ImageColorAt($im, $i, $j); ].how to avoid this problem.Is there any efficient method to extract the rgb values from the jpeg image. Posted by kokila on March 15, 2007 at 05:35 AM. There isn't any faster way in PHP, you can use programs written in C for example to do it faster, you can set a higher value for timeout or you can save the histogram information in an additional and run the script several times. Image operations in PHP take far too long to run in a dynamic page, you have to use some sort of caching to avoid problems. Posted by Indy on March 15, 2007 at 06:59 AM. Nice job! Very interesting stuff. Posted by Danny on March 21, 2009 at 06:14 AM. Posted by John on April 14, 2009 at 12:43 PM. Posted by Andi on May 10, 2009 at 03:25 AM. Posted by Andi on May 10, 2009 at 03:27 AM. This is exactly what I needed... thank you!! Posted by Nancy on August 28, 2009 at 07:44 PM. I've done nothing to the code, just added a path to the picture I'm testing, what is causing this Notice: Undefined offset to appear? Posted by Gerard on September 5, 2009 at 07:47 AM. I've tried it and works fine as stand alone version, how ever I want it intergrated in PhotoPost galery, that works also, but it shows a normal and mirrored histogram, and on some photo's no histogram. Posted by Gerard on September 5, 2009 at 05:54 PM. Finally I got it working, however a histo in Photoshop of image X shows a bit different from a histo generated with this routine, no editing was done to the jpg. Do you have any idea why the two histo's can differ? Posted by Gerard on September 7, 2009 at 07:10 PM. at first, thanks for this nice snippet of PHP code. However, after some research, I discovered that this algorithm would treat color RGB(1,0,0) = RGB(0,1,0) = RGB(0,0,1), meaning that it will mix pure red, green and blue pixels together. The consequence of the above is, that you won't be able to differ between pure red, green and blue values in the histogram, because they represent the same value. Posted by Mireque on October 19, 2009 at 04:48 PM. "To fix this, one should not take the average RGB value of pixel (R+G+B / 3), but the original one (the highest precision available). The drawback is, that it could be pretty slow in PHP and for large images some parallelization should be used..."
Can be have it fixed ?? Posted by Sajan on April 19, 2011 at 07:30 AM. Posted by shah123 on July 15, 2011 at 11:13 AM. Posted by wafa chaht on October 5, 2011 at 12:32 PM. count the pixels - don't add luminance itself! 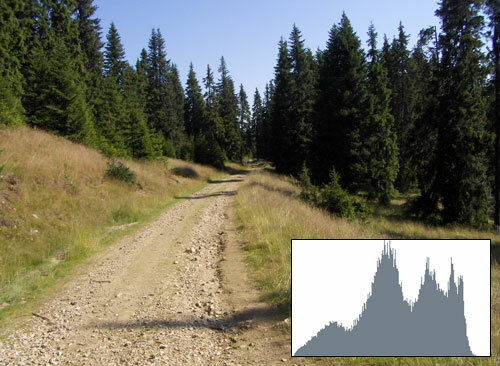 A histogram should count the pixels of a certain luminance. When you add the luminance itself to your array $histo you're getting a wrong histogram. Take an all-black image: $V would be 0 for all the pixels! Instead of having a peak in the histogram to the left side, your code would just have a array with 0 as first value and no value for the other entries. Posted by Sebastian on October 11, 2011 at 06:11 PM. count the pixels, don't add luminance itself! Posted by Sebastian on October 11, 2011 at 06:12 PM. Posted by Vasileios Gavriilidis on December 4, 2012 at 12:38 AM. Posted by Rohan on April 16, 2013 at 09:18 AM. thanks, this is exactly the php code i was looking for..
output for image size 60 x 60 pixels: 60 58 57 61 64 . . . until pixel 3600. Posted by susan on May 2, 2013 at 11:36 AM. We've been using this class: http://www.histogramgenerator.com for our photo galleries and photography portfolios. That script even offers other great (though pretty advanced) features. Sadly, it isn't free but we have been receiving free upgrades since last year, it's worth the money we paid for. Posted by Catherine Mayer on June 28, 2013 at 09:21 AM. this weekend, I've used your source in order to develop a plugin for Wordpress. My plugin shows the EXIF data automatically from the images that the user have included in his post. Now, I am printing the RGB histogram over the thumbnail. I've mentioned this URL as comment in my source and I will link to your web in the final version. Posted by jmaror on August 5, 2013 at 07:22 AM. hi.can you help me for php code for image prosessing? Posted by neda on November 20, 2013 at 08:14 PM.